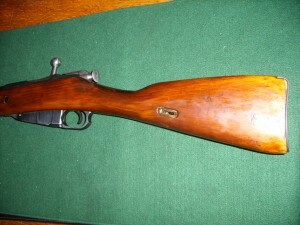 Why should you buy a Mosin Nagant? Side view of Mosin nagant’s bolt and magazine. Mosin are fun to shoot. They are a full power rifle round that is a lot cheaper to shoot than a standard American rifle round. Cheap gun, cheap bullets, give you a lot of trigger time for a lot less on a full power rifle. It is good to get in time with a .22 rifle but also good to get time in with a full powered rifle. 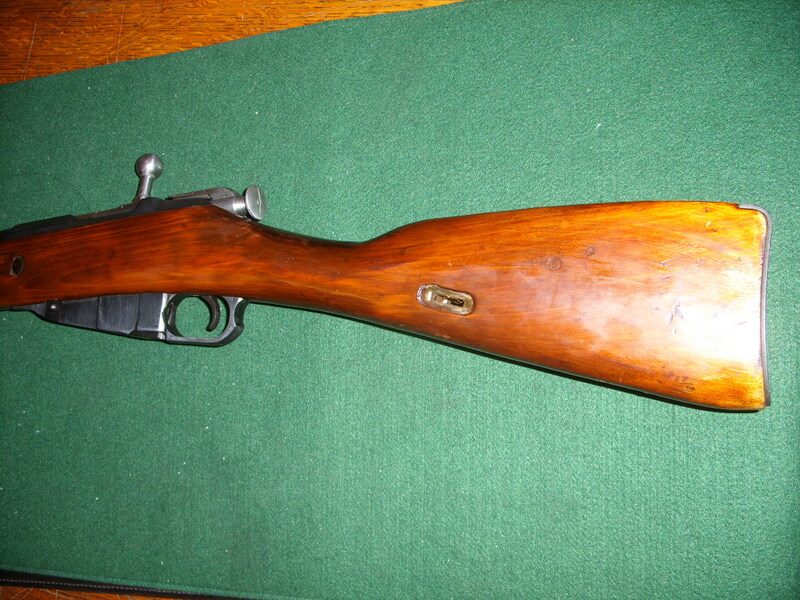 Mosin are easy to clean and maintain. The Caliber is capable of taking down very large Animals if needed. You would be fine hunting anything in North America. 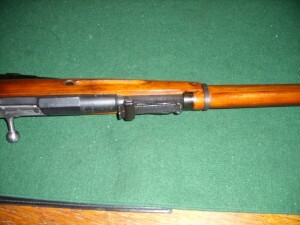 Mosin Nagants are not the pretties or best by far. Some say they have the looks of only a mother could love. 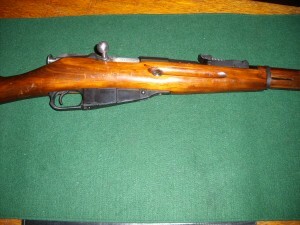 But to tell ya the truth I love my Mosin. 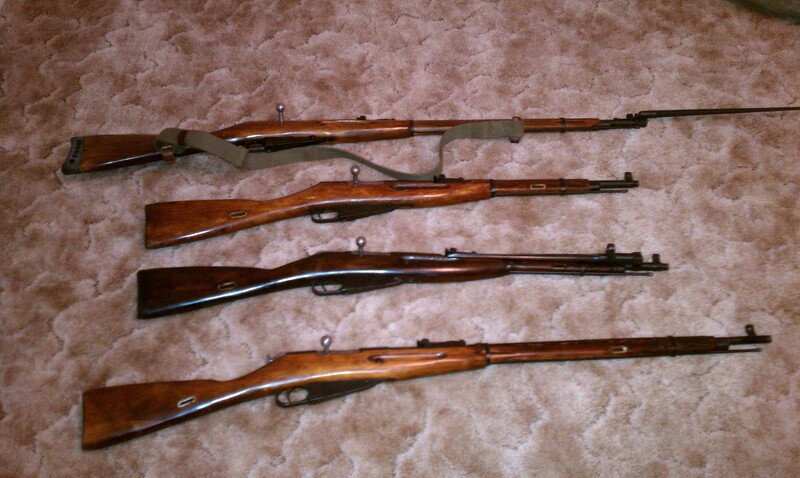 Top and bottom is 91/30 The 2nd from the top is a M-38. 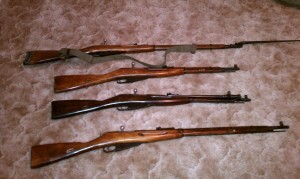 The 3rd from the top is a M-44. 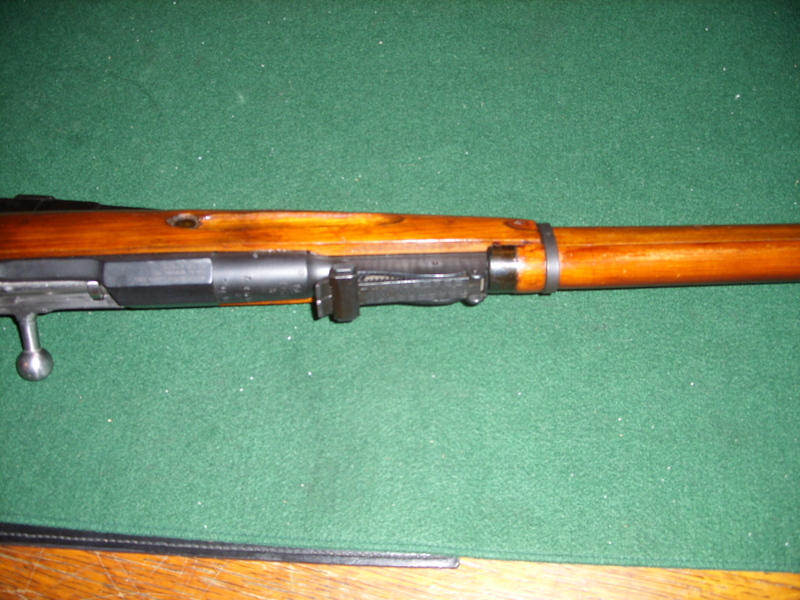 The only difference between the M-38 and a M-44 is the 44 has a bayonet that is attach on the side. 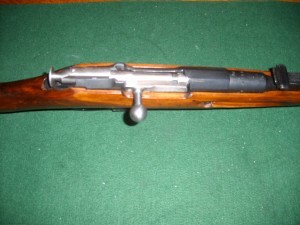 The M-38 bayonet comes off. Check out the pictures and the great videos below. Well, are you gonna buy one? My video says it all…. Okay, maybe it did not. 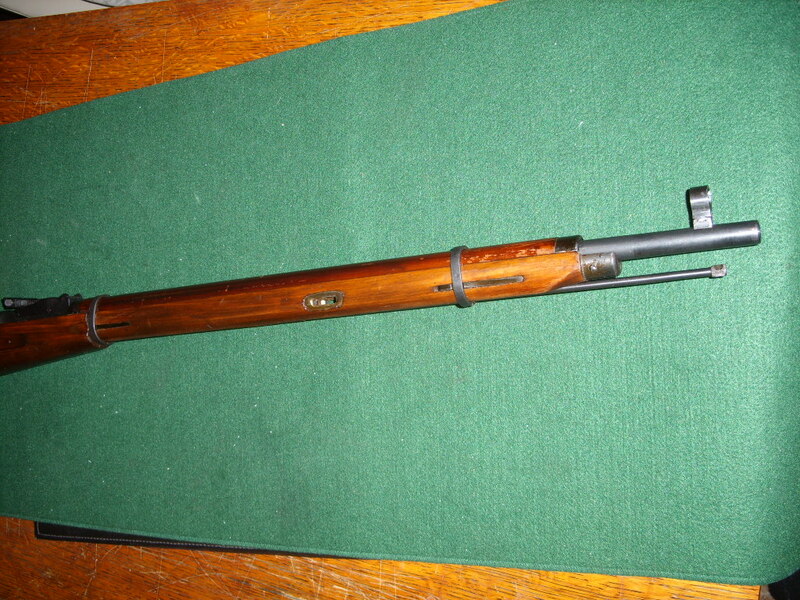 Mosin Nagant are very rough, fast made rifles. 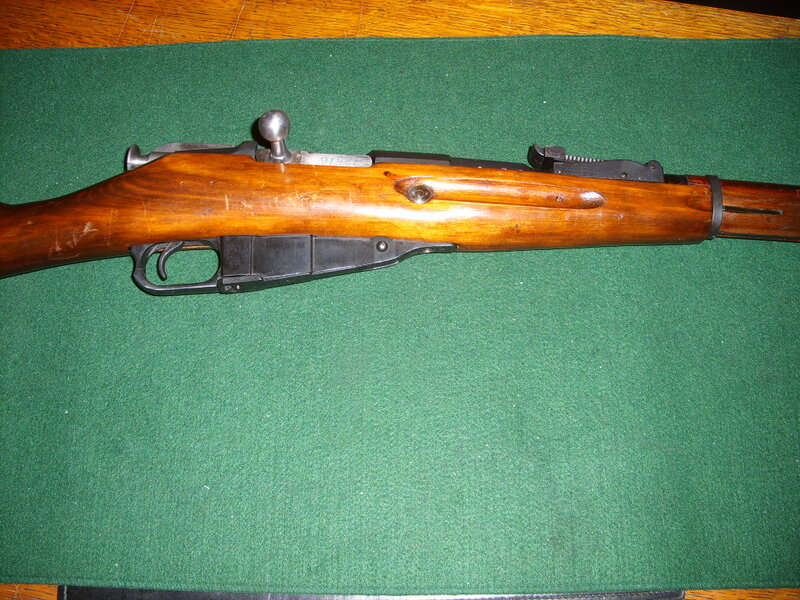 Mosin Nagant are cheap to own and to shoot. But the corrosive ammo is bad for your gun! bah who cares about corrosive ammo cause if you clean right away it does not hurt it. Get some extra strong cleaning solvents. 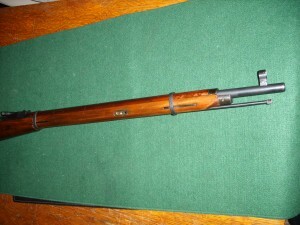 I like having them for barrels and use on the AK piston(it gets really dirty). So comment below why you have not bought one? Or tell me you got one!